My One Little Word for 2014 was Gratitude. As I said in my post from last December, I’ve done a One Little Word, but it’s never been incredibly meaningful. Until 2014, when my One Little Word was GRATITUDE. I was very intentional with my word. I thought about it every single day. I wrote down what I was grateful for every single day. The wordle above shows all those words. 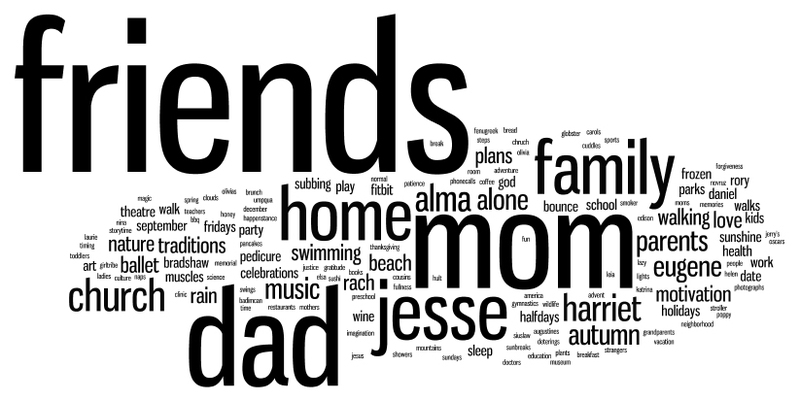 The cool thing about wordle, is that the frequency of each word increases the size of the word in the final word cloud. So, clearly, in 2014 I was most grateful for my friends. Followed closely by my mom, my dad, Jesse, family, and home. Then, a little smaller is Harriet, Alma, church, Eugene, alone, parents, and Autumn. Isn’t that just lovely? Looking back at my list of words, I am a little surprised that Jesse isn’t bigger. I think this is because it’s obvious that I’m grateful for Jesse (and Harriet and Alma). I probably could have filled a whole year writing down just their names, but I was trying to go beyond the obvious and think about what I was seriously, truly grateful for each day. That was usually special time with friends – time that rejuvenated me – time that expanded me – time that filled me. I can still feel that feeling of gratitude that comes with good time with good friends. I’m not sure that I had ever paid much attention to the enormous amount of gratitude I felt for my friends. Or my parents. Sure, I have always appreciated them. They are amazing people. I was lucky to have been raised by my mom and dad (and my step-dad and step-mom). This year, it is clear that they do a lot for me and my family. They watch my kids (and love them in the process) so I can work, or get things done that would be difficult with 2 toddlers in tow. They feed us food. They keep us company. They have ideas for me, and encourage me. I have loved 2014. I have really loved giving thanks every single day. I think I’ll miss it. I’ll always be grateful.